Laws enacted by Congress can be either substantive, procedural, or some of both. Substantive provisions of congressional statutes pertaining to environmental protection in effect say things to the effect of “manage this area as wilderness,” “prevent extinction of species,” and “the water shall be clean.” Substantive provisions are preferred. Procedural provisions of such congressional statutes say in effect “have public involvement,” “consider the best available science,” “consider alternatives to the proposed action,” and “seek to mitigate harm.” Procedural statutes direct federal agencies to adhere to certain processes in the expectation, or at least hope, that this will result in better decisions to protect the environment, but they cannot mandate this result. The substantive provisions of the National Environmental Policy Act (NEPA) were bold and sweeping and could have made over the federal government to be more environmentally friendly. However, the courts have never found that NEPA’s substantive provisions really mean anything and have found that they are not enforceable upon federal agencies. The procedural provisions may still hold but amount to no more than forcing the government to go through the motions before reaching a foregone conclusion. A dead letter is what legal scholars call a law still on the books but ineffectual or defunct in practice. Half of NEPA a dead letter? 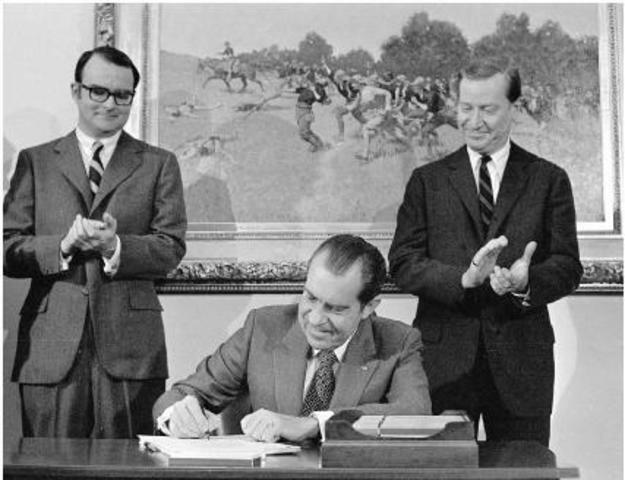 The National Environmental Policy Act was enacted into law in 1970. It was signed by President Richard Nixon, who knew a political bandwagon when he saw it and knew that a veto would be overridden (Figure 1). (Note that it is not the National Environmental Protection Act, as many often miscall it, perhaps conflating it with the Environmental Protection Agency, established later that same year.) As a statute, NEPA is best known for having established the White House Council on Environmental Quality and bringing about the environmental impact statement. In other words, all the courts can do is require that an EIS be prepared if it is required by NEPA. They cannot force an agency to elevate environmental concerns to the degree suggested by the substantial provisions of NEPA. In this case, the court decided that a regional EIS did not need to be prepared because the Department of the Interior plan involved many minor projects that didn’t add up to a major federal action. Now the other half of NEPA—the procedural provisions—are under congressional and administrative threat. The public lands conservation community must fight those proposed rollbacks. However, even if we are successful, it is prudent to rely less on NEPA process to obtain its conservation goals. Later Public Lands Blog posts will examine how to do both.